Isabella first joined the Full Circle team as she was finishing her freshman year at SUNY Geneseo. She started off as a “shadow,” eventually leading her to an internship position with Dr. Michelle. 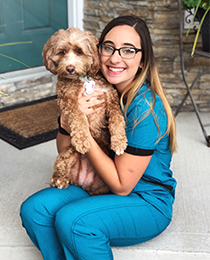 After graduating from the Pre-Vet program in May 2018, she decided to take a year off from school to focus on her vet school applications, while working at Full Circle as a Veterinary Assistant. Isabella has never imagined herself pursuing any other career and loves being a part of the Full Circle team! She strives to not only be as photogenic as her dog, Sparta, but to create a safe and welcoming environment for our clients and furry friends!